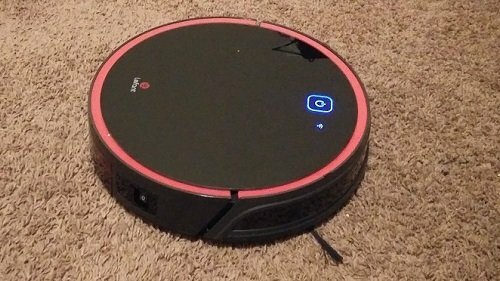 Why Can’t I Use a Steam Cleaner on Unsealed Floors? How Do Steam Cleaners Work? What Are Some Other Benefits of Using a Steam Cleaner? What Kinds of Steam Cleaners Are There? How Should I Clean My Hardwood Floors? What If I Have Other Floors in My House? Have you ever had to gently pry gum off your hardwood floors that someone tracked in with their shoe or scrub stuck-on dirt off your laminate floor in the kitchen? If so, you know how tiresome and time-consuming it is to hand scrub these messes. Often, people turn to steam mops for their hard floor cleaning needs. With a high-quality steam mop, you can greatly reduce the effort and time it takes to remove any stubborn substance from your hardwood, tile, linoleum, marble or other sealed hard floor. Sealed floors are covered with a coating of polyurethane or varnish. This protective coating prevents moisture from penetrating through the wood. If an unsealed floor is exposed to an abundance of moisture, it will absorb more water than it can hold. In turn, the wood will begin to swell, leading to mold and rot. Left in this state for too long, the damaged wood will have to be replaced, costing you an untold amount of money. To clean as quickly and thoroughly as they do, steam cleaners rely on the high water temperatures that create steam. After the cleaner heats the water inside of its reservoir, the water turns to steam, and it’s delivered through a floor nozzle or attachment. Due to its heat, the steam is able to loosen and dissolve the particles that create stains and other messes. Two of their most appealing benefits include saving time and spending less money. However, there are is another major advantage that comes from using a steam cleaner as opposed to a standard mop or scrub brush. The steam’s temperature is high enough to actually disinfect the surface it touches. If you’re recovering from a cold or have a toddler who constantly puts objects in his mouth, the ability to swiftly sanitize your home is invaluable. In general, a steam cleaner falls into one of three categories – a handheld, a mop or a cylinder. Each steam cleaner has its own advantages and drawbacks. A handheld steam cleaner is easy to transport, and it doesn’t take up a lot of room in your storage closet. Plus, handhelds are great for spot cleaning. There are also steam mops. Like a manual mop, steam mops feature long handles. Most stand upright by themselves, and they are suitable for whole-floor cleaning. In addition, there are canister steam cleaners, which hold the most water. However, they are also the heaviest. There are even some steam mops that turn into handhelds. Before you steam mop your hardwood floors, there is one must-do that you should attend to first. Always dust before you mop. Since hardwoods are dust magnets, these floors should ideally be dusted once per day. By keeping them free of dust, coarse particles are unable to accumulate and scratch your floor. Strive to steam mop your hard floors one time every week. While the entire floor shouldn’t require more frequent steam mopping, you should address small spots of dirt as they occur to prevent damage to the floor. Additionally, you should refrain from using strong chemicals with your steam mop’s water because these types of chemicals can eat away at the coating on your floors. As you are cleaning, release the steam in short burst instead of a continuous flow. Otherwise, you may risk warping the wood from an overexposure to concentrated moisture. Also, be sure to attach a clean mop pad before you start steam mopping. Again, this will reduce the likelihood of scratches and dings caused by dirt and dust particles. While some people do have hardwoods throughout every room in their home, a lot of people also have carpet, tile, linoleum and another flooring. If your house contains multiple types of flooring, you need a steam cleaner that efficiently and safely cleans all the floors in your house. If you have hardwoods and tile or linoleum, a great steam cleaner for your floors is a mop that comes with gear designed to tackle grout and uneven surfaces. However, if you have hardwoods and carpet, a better choice is a steam cleaner with a glider that you can use to spot clean your carpet. A bonus to using a steam cleaner to spot clean your carpet is that the mop can sanitize organic messes and wipe out the odors that come along with them. The Bissell Symphony steam vacuum is the perfect little helper for cat and dog owners alike. 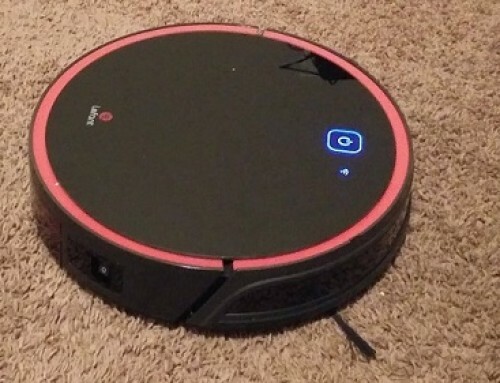 It’s a steam mop that not only looks like a vacuum but acts like one too. 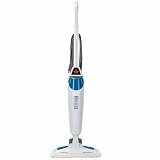 The mop’s 3.3-amp motor offers a high level of suction to remove stubborn pet hair and debris. From the digital fingertip controls, you can select from either vacuum mode or one of two steam strengths. 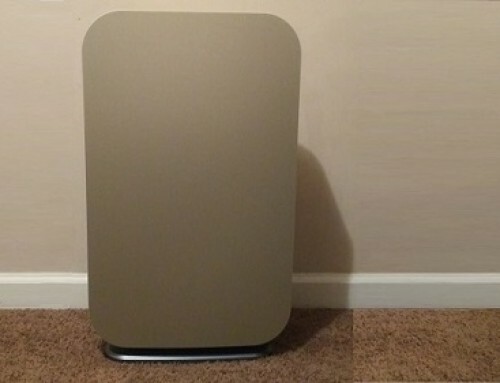 Its 1,100-watt heater produces steam in just 30 seconds, so you can quickly kill 99.9 percent of the bacteria and viruses that lurk on your floors. You’ll know that steam is available thanks to the appliance’s steam indicator light. With features like a 25-foot power cord and a D-shaped handle with comfort grip, the steam mop is easy to maneuver. Simply attach a reusable or disposable mop pad to the bottom of the 11-inch-wide floor nozzle, and the 9.74-pound appliance is ready to tackle any mess your pet leaves behind. To make life easier, this steam cleaner holds 13 ounces of water, and you can open the dirt canister from the bottom by touching the lever. 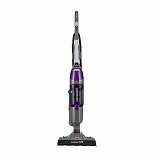 No matter the difficulty of the mess or the type of hard floor, the BISSELL 1940 PowerFresh Steam Mop is tough enough to handle it. The 1,500-watt heater inside of this steam mop can heat 16 ounces of water in just 30 seconds. You can choose from one of three steam levels from the electronic on-board controls as soon as the indicator light changes, and you can pour in more water as you go, saving you valuable time. To remove stubborn grime and clean tile grout, the mop is equipped with a scrubber that flips down in front of the floor nozzle. You also get two reusable microfiber pads that are infused with an antimicrobial material. Plus, the steam mop comes with several Febreze fragrance discs, which give your home a pleasant aroma. With its low weight of 6 pounds and its D-shaped, soft-textured handle, you’ll find it easy to maintain control over the steam mop as you clean. The pivoting head of the mop can maneuver around furniture with ease, and its width of 12 inches means it can cover a lot of floor in one pass. Plus, the 23-foot-long cord offers a large cleaning radius. With the 5-in-1 Steam Mop from Light N’ Easy, you can steam clean your hardwood floors and every other surface in your home, including carpets, upholstery, mattresses clothing, mirrors, glass and much more. Regardless of how you use it, it only takes 30 seconds for the appliance to generate steam. 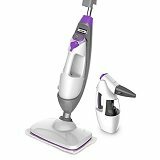 The floor nozzle boasts an 11.8-inch-wide path and 20-foot-long power cord, so you can clean any floor fast, and the steam mop comes with two reusable microfiber pads that are ideal for hard-floor cleaning. You can choose from among three steam settings, with the highest setting giving you up to 25 minutes of continuous steam. By pushing the release button, you can remove the handheld portion to meet all your above-floor sanitizing and dewrinkling needs. A flexible hose allows you to reach into narrow gaps while the triangular attachment is well-suited for upholstery freshening. It even comes with a tapered nozzle for hard surfaces and tough jobs. This steam mop from SKG can clean in places where many other steam mops can’t go. The 1,500-watt heater can warm the water to 212 degrees Fahrenheit in well under a minute, making it fast and effective. You can control how much steam it puts out by turning a simple dial from low for everyday freshening up or high for tough messes. It comes with three washable microfiber pads and a glider attachment that pops on and off for carpet spot cleaning. The floor head is shaped like a triangle for deep corner cleaning. For smooth maneuverability, the head swivels around furniture and other obstacles. You also get the works when it comes to accessories, including nozzles, brushes and an extension hose. With 20 feet’ worth of power cord, you don’t have to constantly search for an electrical outlet. The steam mop is equipped with a shoulder strap for stability, and the reservoir can hold approximately 2 cups of water at a time. For your convenience, the steam mop gives you audible alerts if the reservoir is empty or the mop has been left on standby for too long. Use less elbow grease and give your arms a break. 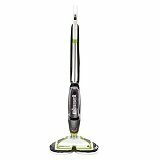 The 0.9-amp inside of the Bissell 2039A SpinWave Floor Mop rotates the two discs on the floor head in a counter direction of one another to quickly remove stubborn dirt and grime. With reusable soft pads for routine cleaning and scrubbing pads for sticky disasters, there is no mess this mop can’t conquer. To help you maneuver the mop, the floor nozzle pivots around corners and objects. However, with a weight of 11 pounds, you’d have an easy time using it even without the swivel steering. The cord is 22 feet long, so you can enjoy a huge cleaning radius. Plus, you get a complimentary 8-ounce bottle of Bissell’s Multi-Surface cleaning formula for sealed hard floors. Another time-saver is its reservoir. With a capacity of 28 ounces, the water reservoir doesn’t require multiple refills per cleaning session. The angled handle keeps your grip firm and your hand comfortable. Controlling the nozzle is easy with just a press of the thumb-touch button. Shopping for a steam mop is like buying any other home appliance – the features determine its quality. 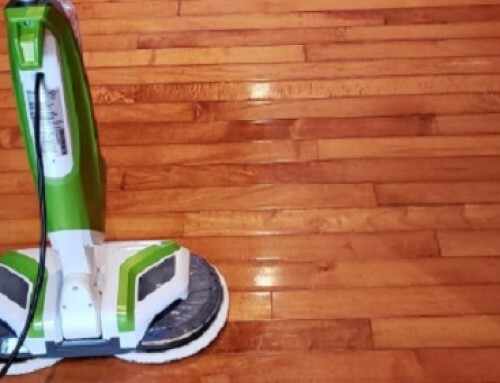 When it comes to getting a steam mop to clean your hardwood floors, certain features matter more than others. This guide will help you learn what to look for, so you get the most out of your money. The time it takes to reach a steaming temperature and the temperature itself are both important. Ideally, the steam mop should heat the water in 1 minute or less to a minimum temperature of 171 degrees Fahrenheit. Steam that’s lower than this temperature won’t be able to sanitize your floors, and it’ll leave too much moisture behind, possibly damaging your floors. You also want to make sure the steam cleaner is easy to lift. As you steam clean your hardwood floors, you don’t want to keep the steam concentrated in one area for too long. While a comfortable lifting weight is subjective, you should be fine using any steam mop under 15 pounds. Hardwood floors are delicate by nature. Therefore, the cleaning pad you use should not be harsh or abrasive. Instead, use a steam mop that comes with a soft cleaning pad, so you don’t scratch your floors. A cushioned, absorbent pad like one made of microfiber is ideal. Since hardwoods are more susceptible to moisture, you must be careful with the flow of steam. The steam cleaner you buy should have an adjustable mist output with a low-steam option for your hardwoods. If not, the mop should at least have a start-stop control for the steam. Also, the delivery of steam should be even to adequately cover all areas of your floor. 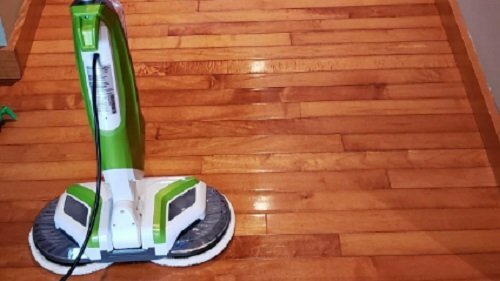 While not necessary if you’re buying a steam mop just for your hardwood floors, it’s always nice to own a versatile appliance. 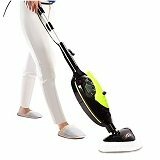 Some steam mops can also be used as a handheld steamer, allowing you to sanitize and freshen hard and soft surfaces above the floor. There are also steam mops for hardwoods that come with a glider for carpet cleaning. The fewer number of trips to the sink you have to make, the less time it will take for you to clean your floors. 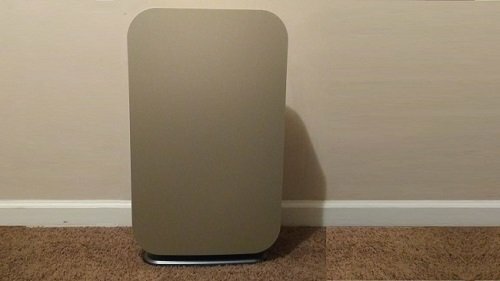 Therefore, you need to look for one with a large capacity. For added convenience, some steam mop models allow you to add more water while you’re actively using the mop as opposed to turning it off first and waiting for the water to reheat. You should also pay attention to the way the steam mop moves. Of course, you want it to be as easy as possible to maneuver. Features such as a pivoting floor nozzle, a chest strap and an ergonomic handle will help you navigate your floors with little effort. This is another area where ease of use is important. No matter if the controls consist of dials you turn or buttons you press, they should be clearly illustrated or labeled. It also helps if the buttons are on the handle, so you won’t have to strain to reach them. About Steam Mops A steam mop is a mop that makes use of steam to thoroughly clean carpet and floors. In contrast to a regular mop, which requires cleaning substances , a steam mop uses heat from steam to disinfect the floors.